Once upon a time there was a bat named Stellaluna. And one day she said, "Mommy, I am going to the mountains." Her mommy said, "Ok, but be careful." So she flew to the mountains. And she was so afraid. She saw a mountain lion. She said, "I wish mommy was here." A lion spied her. Stellaluna flew down to the lion's cave. And he was not happy. And Stellaluna's mommy was getting worried. So her mom flew to a jungle near the mountains. Stellaluna was hungry.She flew down too. And they met on a branch. Stellaluna was so happy and her mommy was happy too. They flew home and they lived happily ever after. Written and Illustrated by Elizabeth P.
One day Stellaluna always wanted to fly and her mommy taught her.Stellaluna tried to fly and she fell in the trees. She saw a bird and she fell in the nest. Stellaluna showed them how to hang by their feet, but the birds' mommy came back. She was mad at Stellaluna. Stellaluna wanted fruit, but poor Stellaluna had to eat grasshoppers. One day Stellaluna went flying with the birds. She went too far. The birds went back in the nest. Stellaluna was left all alone, but Stellaluna found her mom. Stellaluna flew with her mom and she said let's go get some fruit. They lived happily ever after. Written and Illustrated by Brianna A. Once upon a time there lived a little girl bat and her name was Stellaluna. She was 7 and a half. Her mom went to get fruit and an owl struck her mom. Stellaluna fell from her mom. She caught a branch and she fell into a bird nest. The momma bird came home. They had to eat bugs. They learned to fly. Stellaluna got lost in a forest and couldn't find her way back. Finally it was time for bed and she found her way back. One day a mother bat was having a baby. She called her Stellaluna. One night they went out to feast. An owl came and Stellaluna fell into the forest! She fell onto a branch for the night, but in the morning she fell onto another branch. Her mother came back and took her away. Written and Illustrated Jacob S.
Some bats eat fruit and some eat frogs. They live in the forest where there are trees and weeds. And sometimes owls come out and go after the bats. But the owls did not get Stellaluna or her mom because she was too fast. Written and Illustrated by Austin B.
Stellaluna ate fruit. Stellaluna's mom was looking for food for them but instead an owl attacked them. Stellaluna fell in the forest. She fell on the branch. She fell again in the bird's nest. She heard birds chirping. The bird fed her bugs. Stellaluna opened her mouth. She did not like the taste. She did make a funny face. The birds got bigger and so did Stellaluna. One day Stellaluna said lets go out to fly. They flew for hours and hours. One said let's go home. Stellaluna kept flying but the birds went back home. Stellaluna dropped and hung by her thumbs. Another bat came on her branch and said you are upside down. I am not upside down. A lot of bats came and Stellaluna's mom was one of them. And Stellaluna's mom said I will not leave you. Written and Illustrated by Stephanie H.
One day in the forest a baby bat was born and her name was Stellaluna. It was night. Her mom has been out looking for food. She knew that her baby was safe. She could see well. The tree was right there. Her mom was flying so fast that she pushed Stellaluna off the tree. And she said, hi luna. Oh it's you again. Can you take me home? Of course, she said and she took her home. Her mom took her home and gave her lots of hugs. And Stellaluna made a new friend. 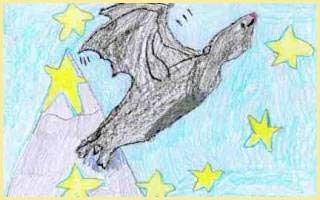 Written and Illustrated by Melia H.
Stellaluna flew to a mountain. She got lost in a cave. Her mom was in the cave. Peep! Peep! Peep! Stellaluna peeped as loud as she could and finally her mom came! She said I love you. She said I will take you home. When they got home they went to bed. Written and Illustrated by Camron B. Once upon a time there was a mommy bat that had a baby. And the mommy bat named the baby bat Stellaluna. There was an owl. It was mean and it was greedy. So the owl attacked her in the jungle and made Stellaluna fall down, down, down to the ground! But she got on a branch. Before she fell on the ground and she couldn't hold on any more she fell into a cave. And there were bats. She said I'm lost. But the other bats didn't say anything. They just laughed at her and Stellaluna flew off. And somebody was chasing her. So she stopped to see who it was. And it was her Mommy. Her mommy said I love you Stellaluna. Written and Illustrated by Paul B. One cold night a baby bat was born. I'll name you Chellaluna, said her mother. Then an owl attacked. And Chellaluna dropped off of her mom. Chellaluna! cried her mom. Mother! Uhh! Where am I? The jungle, said a small voice. Who said that? Me! That's who down here! What's your name? Chellaluna! What's yours? If I tell you will you laugh at me? No! Bee-dee. Come on let's get some fruit! Fruit? Cheese you mean. What's that? I'm a bat. Mom! How are you? Chellaluna. Come in. Here's cheese. Eat it now! Okay. Don't hang by your feet. Mother! Chellaluna! My baby I know some good fruit. Written and Illustrated by Nikki W.